The Univeristy of Virginia McIntire Department of Music presents a residency by DITHER, ( http://www.ditherquartet.com/), a New York based electric guitar quartet, is dedicated to an eclectic mix of experimental repertoire which spans composed music, improvisation, and electronic manipulation. 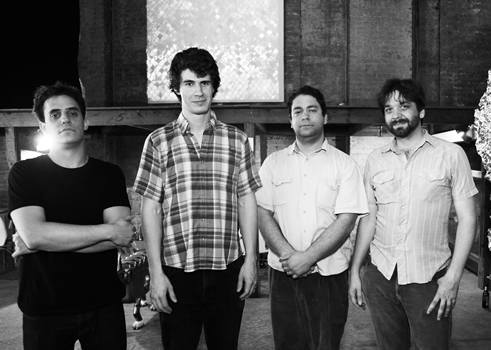 Formed in 2007, the quartet has performed in the United States and abroad, presenting new commissions, original compositions, improvisations, multimedia works, and large guitar ensemble pieces. With sounds ranging from clean pop textures to heavily processed noise, from tight rhythmic unity to cacophonous sound mass, all of Dither’s music wholeheartedly embraces the beautiful, engulfing, and often glorious sound of electric guitars. The quartet’s members are Taylor Levine, David Linaburg, Joshua Lopes, and James Moore. On Wednesday, February 20, Nick Didkovsky will give an exhilarating presentation on all things composition and guitar - from uncovering the deep structor of Black Sabbath solos to making pieces with "automatic composition software" of his own design. Nick Didkovsky is a guitarist, composer, band leader, and software programmer. In 1983, he founded the avant-rock octet Doctor Nerve. He presently resides in New York City, where he composes, creates music software, and teaches computer music composition at New York University. On Thursday, February 21 the Dither Ensemble, a New York based electric guitar quartet, will perform a program featuring new music for acoustic and electric guitar, as well as other fretted instruments, including banjo and mandolin. Dither will be performing works by John Zorn, Fred Frith and others. On Friday, February 22 the Dither Ensemble will perform new music by UVA Emerging Composers. This concert will feature an evening of music written expressly for Dither by University of Virginia composers. The music will feature a wide range of approaches to composition and to the unusual guitar quartet format. Some of the pieces featured in the concert will include a work based on mash-ups and re-contextualization of classic rock transcriptions, a video-game-based interactive piece using animated scores via iPads, a radical transformation of Eddie Van Halen's seminal guitar solo "Eruption" into a contrapuntal sound mass, a sonificiation of electron spin models, a meditation on traditional Korean vocal music, and a work composed on a small handmade instrument discovered in the Grand Canyon that was fashioned by a cowboy named Randy Irwin. This concert will take place in one of the oldest and most beautiful buildings in downtown Charlottesville, Christ Episcopal Church (http://www.christchurchcville.org/). This venue promises to provide an exceptional setting for this group's chamber-music approach to the electric guitar ensemble. Don't miss the Charlottesville première of one of the most important new groups of NYC's new music scene in collaboration with some of U.Va. 's innovative composers.